Background and Purpose: Momordica charantia L. (Cucurbitaceae) is used as both food and management of diverse human diseases science ancient time, including in the treatment of worm infection. This study was aimed to evaluate the comparative anthelmintic and anti-oxidant activity of juice and extracts of whole fruit, peels, and seed of M. charantia. Materials and Methods: In vitro anthelmintic activity of methanol extract of whole fruit, fruit peels, seed and fresh juice whole fruit, peels of M. charantia was investigated against Indian adult earthworms (Eisenia foetida). Extracts and juices are also investigated for their anti-oxidant activity using 2,2-diphenyl-picrylhydrazyl radical (DPPH• ) scavenging assay method. Results: Extracts and juice showed potent anti-oxidant and anthelmintic activity. Methanol extract of fruit peel demonstrated strong DPPH• scavenging activity (IC 50 = 29.02 ± 0.86 μg/ml), juice of fruit peel also produced good radical scavenging effect (57.30 ± 0.99 μmol TE/ml). Methanol extract of fruit peel showed potent anthelmintic effect which is similar to standard albendazole. Whole fruit and seed extract also produced significant anthelmintic effect. Whole fruit juice and peel juice showed similar but moderate in vitro anthelmintic effect. Conclusion: The wormicidal activity of extract and juice against earthworms suggests that they are effective against parasitic infections of humans. Results justify the use of fresh kerala juice by traditional medicinal practitioner to cure worm infection, and showed the potential to develop natural anthelmintic constitute from the fruit of the plant. Anthelmintic potential of different parts of M. charantia including fruits and seeds were described in traditional medicinal knowledge, and some current investigations have also reported the anthelmintic effect of M. charantia fruit. ,,,,, Peoples of India usually consumed juice of both fruit peels and seed, and also as a vegetable. However, no comparative study was available, keeping in view their widespread utilization, the present study was aimed to evaluate the comparative anthelmintic and anti-oxidant activity of juice and extracts of whole fruit, peels and seed of M. charantia against Indian adult earthworms (E. foetida). Mature fruits of M. charantia L. were collected in December 2013 from the local market of Guwahati, Assam. Plant material was identified and authenticated by Dr. AA MaO, Senior Scientist, Botanical Survey of India, Shillong, India (No: BSI/ERC/2014/Plant identification/786). Whole fruits were cut into small pieces, and air dried under shed. Dried fruit parts were pulverized to a fine powder using a mechanical grinder. The powder was extracted with methanol using Soxhlet apparatus. The extract was concentrated by distillation and solvent was evaporated to dryness on the water bath to get the methanol extract of whole fruit of M. charantia (MWF). To obtain the methanolic extract of fruit pulp (MFP), seeds were removed from the fruit and then fruit pulps were dried under shed. The dried fruits pulps were pulverized to a fine powder and extraction was carried out using methanol in Soxhlet apparatus. The extract was concentrated, and solvent was evaporated to dryness. A similar procedure was carried out by taking the seeds only to obtain methanolic extract of fruit seed (MFS). The fresh whole fruits were collected and washed properly. The 50 g of fruit was grinded using a mechanical grinder and screened through fine sieve to collect the juice of whole fruit (JFW). Similar protocol was used after removing the seeds to obtain juice of fruit pulp without seed (JFP). Indian adult earthworms (E. foetida) were used for anthelmintic activity. Earthworms were authenticated and supplied by North East Green Tech Private Limited, Bamunimoidam Guwahati, Assam, India. Group 10: JFP 30 ml. The results are expressed as mean ± standard error of the mean the statistical difference was tested by using one-way analysis of variance followed by Tukey tests. P <0.001 was used as a criterion for statistical significance. Momordica charantia fruits and seeds are known for their wormicidal activity since ancient time in Indian societies. People consume fruit and seed as vegetable, and also takes juice of the fruit to remain healthy. Few studies have investigated their anti-oxidant activity and the potency of whole fruit, leaves against different helminth species. ,,,,, This study was undertaken to compare the activity of fruit, seed in a different form against Indian earthworm. Among the three extracts, the highest yield was observed for MFP (21.94% w/w) followed by MFW (16.9% w/w), MFS (8.56% w/w). While yield of the JFP was found 18 ml/100 g fruit pulp and 16 ml/100 g whole fruit for JWF. Preliminary phytochemical test showed that chemical constituents such as glycoside, alkaloid, carbohydrate, saponin were commonly present in extract and juice. Among the extracts, MFP showed highest DPPH• scavenging activity (IC 50 = 29.02 ± 0.86 μg/ml), followed by MFW, MFS. JFP showed better radical scavenging effect (57.30 ± 0.99 μmol TE/ml) than JFW (45.41 ± 0.42 μmol TE/ml) [Table 1]. DPPH is a stable free radical, on reaction with anti-oxidant the electron of DPPH• is paired off, which results in decolorization of DPPH solution. , The strong scavenging capacity of the extracts and juice indicated this effect in a part might be responsible for biological activity. 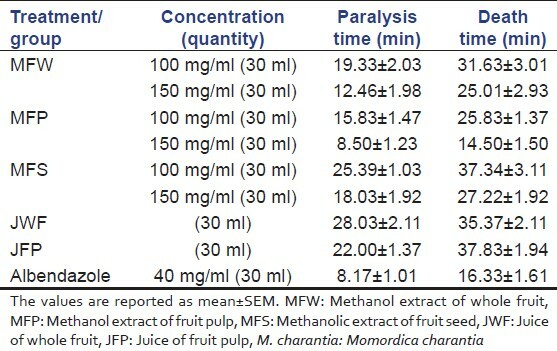 Methanolic extract of fruit pulp at 150 mg/ml showed almost similar effect on paralysis (8.50 min) like that of albendazole (8175 min), while higher concentration of MFP found more effective in terms of death time (14.50 min) than standard drug (16.33 min). MFS and MFW also demonstrated potent anthelmintic effect. Among the juice, JFP showed quick paralyzis time (22 min) while JFW produce quick death to the worms (14.5 min). Both the juices showed almost similar activity [Table 2]. Resistance toward the available synthetic medicine possesses a serious problem worldwide. Plant-derived drugs are considered a potent source of new anti-microbial agents. Due to the easy availability, anatomical resemblances with intestinal worms and their reaction to anthelmintics,  Indian adult earthworms (E. foetida) have been used for this comparative evaluation. Preliminary phytochemical analysis and previous investigations confirmed that fruit and seed contain tannins, glycosides along with other chemical constituents. These phytochemicals can attach with free proteins in the gastrointestinal tract or glycoprotein on the parasite cuticle and cause deaths. Anti-oxidant activities of extract and juice could have contributed, at least partly, to the therapeutic benefits of M. charantia fruit against worm infection. The wormicidal activity of extract and juice against earthworms suggests that they are effective against parasitic infections of humans. Results showed that the extract from fruit pulp showed better activity that is similar to that of standard drug. Study confirmed that fresh JFP exhibited potent activity against Indian earthworm, which justify the use of Kerala juice by traditional medicinal practitioner to cure worm infection. In summary, this study highlight that extract and juice of M. charantia whole fruit, peels, seed have potent anti-oxidant and anthelmintic effect. Fruit peel extract exhibited very good anthelmintic effect, thus results give the experimental basis to understand the use of juice of the fruit in traditional medicine, as an anthelmintic agent. In view of the potential use of M. charantia fruit in the traditional medicine, its therapeutic benefits and bioactive compounds warrant further investigation. Momordica charantia (bitter melon). Monograph. Altern Med Rev 2007;12:360-3. Paul A, Raychaudhuri SS. Medicinal uses and molecular identification of two Momordica charantia varieties - a review. Electron J Biol 2010;6:43-51. Kumar KP, Bhowmik D. Traditional medicinal uses and therapeutic benefits of Momordica charantia Linn. Int J Pharm Sci Rev Res 2010;4:23-8. Kumar DS, Sharathnath KV, Yogeswaran P, Harani A, Sudhakar K, Sudha P, et al. A medicinal potency of Momordica charantia. Int J Pharm Sci Rev Res 2010;1:95-100. Thenmozhi AJ, Subramanian P. Antioxidant Potential of Momordica charantia in Ammonium Chloride-induced Hyperammonemic Rats. Evid Based Complement Alternat Med 2010. Hamissou M, Smith AC, Carter RE Jr, Triplett JK 2 nd . Antioxidative properties of bitter gourd (Momordica charantia) and zucchini (Cucurbita pepo). Emir J Food Agric 2013;25:641-7. Virdi J, Sivakami S, Shahani S, Suthar AC, Banavalikar MM, Biyani MK. Antihyperglycemic effects of three extracts from Momordica charantia. J Ethnopharmacol 2003;88:107-11. Shetty AK, Kumar GS, Sambaiah K, Salimath PV. Effect of bitter gourd (Momordica charantia) on glycaemic status in streptozotocin induced diabetic rats. Plant Foods Hum Nutr 2005;60:109-12. Chan LL, Chen Q, Go AG, Lam EK, Li ET. Reduced adiposity in bitter melon (Momordica charantia)-fed rats is associated with increased lipid oxidative enzyme activities and uncoupling protein expression. J Nutr 2005;135:2517-23. Pongthanapisith V, Ikuta K, Puthavathana P, Leelamanit W. Antiviral Protein of Momordica charantia L. Inhibits Different Subtypes of Influenza A. Evid Based Complement Alternat Med 2013;2013:729081. Mwambete KD. The in vitro antimicrobial activity of fruit and leaf crude extracts of Momordica charantia: A Tanzania medicinal plant. Afr Health Sci 2009;9:34-9. 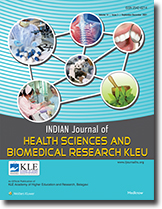 Subramaniam J, Murugan K, Kovendan K. Larvicidal and pupcidal efficacy of Momordica charantia leaf extract and bacterial insecticide, Bacillus thuringiensis against malarial vector, Anopheles stephensi Liston. (Diptera: Culicidae). J Biopesticides 2012;5 Suppl: 163-9. Hussain S, Sharma V, Saxena AK. Fruit part of Momordica charantia possesses remarkable in vitro anticancer efficiency against eight human cancer cells. Int J Plant Sci 2013;8:140-3. Jilka C, Strifler B, Fortner GW, Hays EF, Takemoto DJ. In vivo antitumor activity of the bitter melon (Momordica charantia). Cancer Res 1983;43:5151-5. Ishola IO, Akinyede AA, Sholarin AM. Antidepressant and anxiolytic properties of the methanolic extract of Momordica charantia Linn (Cucurbitaceae) and its mechanism of action. Drug Res (Stuttg) 2014;64:368-76. Adewale OO, Oduyemi OI, Ayokunle O. Oral administration of leaf extracts of Momordica charantia affect reproductive hormones of adult female Wistar rats. Asian Pac J Trop Biomed 2014;4:S521-4. Prashanthi R, Mohan N, Siva GV. Wound healing property of aqueous extract of seed and outer layer of Momordica charantia L. on albino rats. Indian J Sci Technol 2012;5:1936-40. Patel R, Mahobia N, Upwar N, Waseem N, Talaviya H, Patel Z. Analgesic and antipyretic activities of Momordica charantia Linn. fruits. J Adv Pharm Technol Res 2010;1:415-8. Shahadat HM, Mostofa M, Mamun MA, Hoque ME, Awal MA. Comparative efficacy of korolla (Momordica charantia) extract and Ivermec® pour on with their effects on certain blood parameters and body weight gain in indigenous chicken infected with Ascaridia galli. Bangladesh J Vet Med 2008;6:153-8. Beloin N, Gbeassor M, Akpagana K, Hudson J, de Soussa K, Koumaglo K, et al. Ethnomedicinal uses of Momordicacharantia (Cucurbitaceae) in Togo and relation to its phytochemistry and biological activity. J Ethnopharmacol 2005;96:49-55. Tjokropranoto R, Nathania MY. Anthelmintic effect of ethanol extract of pare leaf (Momordica charantia L.) against female Ascaris suum worm in vitro. J Med Planta 2011;1:33-9. Lal J, Chandra S, Raviprakash V, Sabir M. In vitro anthelmintic action of some indigenous medicinal plants on Ascardia galli worms. Indian J Physiol Pharmacol 1976;20:64-8. Sharma S , Tandon S, Semwal B, Singh K. Momordica charantia Linn: A comprehensive review on bitter remedy. J Pharm Res Opin 2011;1:42-7. Tandon V, Yadav AK, Roy B, Das B. Phytochemicals as cure of worm infections in traditional medicine systems. In: Srivastava UC, Kumar S, editors. Emerging Trends in Zoology. Delhi: Narendra Publishing House; 2011. p. 351-78. Helmby H. Helminths and our immune system: Friend or foe? Parasitol Int 2009;58:121-7. Hotez PJ, Brindley PJ, Bethony JM, King CH, Pearce EJ, Jacobson J. Helminth infections: The great neglected tropical diseases. J Clin Invest 2008;118:1311-21. Kokate CK, Purohit AP, Gokhale SB. Pharmacognosy. Pune: Nirali Prakashan; 2007. Khandelwal KR. Practical Pharmacognosy, Techniques and Experiments. 11 th ed. Pune: Nirali Prakashan; 2004. Sen S, De B, Devanna N, Chakraborty R. Total phenolic, total flavonoid content, and antioxidant capacity of the leaves of Meyna spinosa Roxb. an Indian medicinal plant. Chin J Nat Med 2013;11:149-57. Jakobek L, Seruga M, Medvidovic-Kosanovic M, Novak I. Anthocyanin content and antioxidant activity of various red fruit juices. Dtsch Lebensmitt Rundsch 2007;103:58-64. Sen S, De B, Devanna N, Chakraborty R. Anthelmintic and in vitro antioxidant evaluation of fractions of methanol extract of Leea asiatica leaves. Anc Sci Life 2012;31:101-6. Devanna N, Chakraborty R, Sen S, De B. Tribal medicinal plants of Tripura, India: A scientific search. New Delhi: Serial Publications; 2014. Chakraborty R, De B, Devanna N, Sen S. Total phenolic, flavonoid contents and antioxidant capacity of Marsilea minuta L., an Indian vegetable. Int J Pharm Sci Rev Res 2012;16:79-84.